Description Photocopy of group portrait. 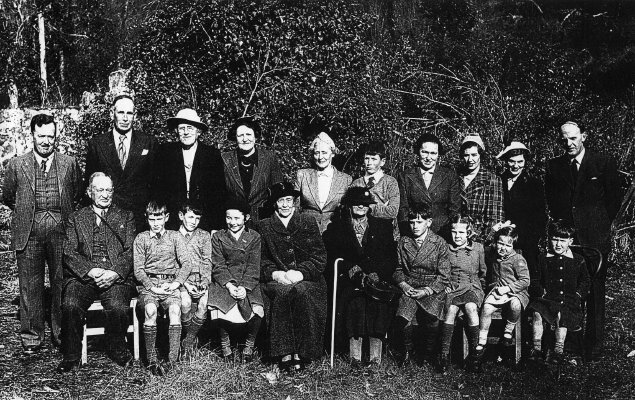 Back row: D'arcy Stace; Peter (Leitrim) Mowat; Hermione Mowat; Evelyn Clouston (nee Mowat); Erica Parsons (nee Trolove); Robert Mowat (Peter's son); Pam Clouston (nee Parsons); Clare Richards; Jan Parsons; A.P. (Bob) Clouston [I think this should be R.P. Clouston, see Notes - Jenny Pierson, 15 May 2014]. Front Row: H.J. Stace; Alex Mowat; Peter Mowat; Elizabeth Stace; Bertha Stace; Dolly Nicholson; Dan Clouston; Prue Clouston, Belinda Parsons; Jock Clouston. When using this image please quote "Image courtesy of Marlborough Museum - Marlborough Historical Society Inc"